Ok, the first savings/investment update of the year and things don’t look too different from much of last year. My ‘income’ this month has been derived from my pay-in-lieu-of-notice (PILON) from my last job. Previously, my savings rate calculation was based on my net income from my main salaried job, ie net of tax, NI and company pension contribution. The PILON is net of tax and NI. So, how have I done in January? My savings rate was 53.6%, a great start to the year! That said, if I’m still jobless in April, my savings rate is going to be at or around 0%…. However, next month’s number should get a very big boost as it’ll include my bonus. 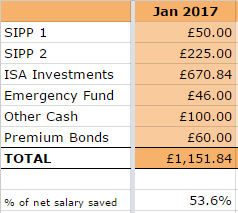 My highest ever savings rate so far is 70.4%, achieved in March 2015. It’s possible I could better this…watch this space! January’s savings was boosted by £70.84 from TopCashback* and £50 from rent received. With the crippled £ sterling doing a creditable impression of a bottom-feeder, my Future Fund continues to ignore other political shenanigans and is now up to £92.321. A couple of December dividends which weren’t paid into my account until early January pushed the total income received to £68.16. In January 2016, I received only £26.21. 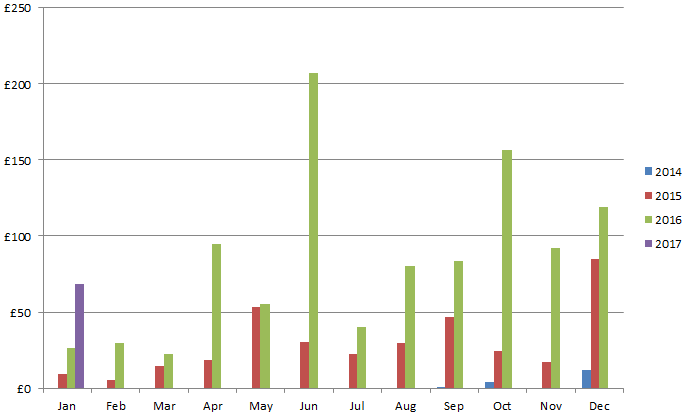 A decent year-on-year increase, though a bit of a slow start to the year against my goal of £1,500. The first few months have historically been quite low for me dividends-wise, so nothing of any real note until April I think. Still, it looks pretty good in the graph! I also received £13.65 from my P2P investments. 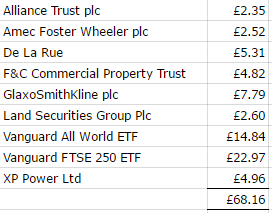 No purchases made in any new shares/investment trusts – I just topped up some of my existing tracker funds. Not a lot of time to do any MB and I lost a week as I was jetlagged and then unwell. I still made £137 in profit. Again, this was pretty much entirely on football bets only (including accumulators). Not such a fantastic start, considering I’ve set myself a goal to earn £4,000 this year via MB. Still, let’s hope I can get the profits rolling in in the coming months. I have now made a total of £3,725 profit so far from MB since I started in March 2016, which I’m really pleased about. Again, I’ll stress that it’s not ‘easy’ money as you need to put in effort to make the money but I enjoy it and I don’t have any other hobby which makes me money. The matched betting guide I subscribe to is OddsMonkey*. It’s a great website for beginners and seasoned matched bettors alike – for beginners, there are plenty of tutorials which provide you with step-by-step guides on how to make profits and to work through special offers. They also offer one-to-one sessions for those who need a little more help. For the more experienced, the tools offered by OddsMonkey are fantastic, including the Each Way Matcher, Dutch Finder and Acca Matcher, all of which I have used successfully. There’s also a friendly forum for you to ask any questions. Anyway, you can join for free to try it out. Hope everyone had a a great January – have a great weekend! Congrats on a cracking start to the year! A corking increase on the dividends as well – smashed my months dividends out the ground, as I seem to always do badly in Jan / Feb. Keep them reinvesting, adding new capital when you can and they will really start to take off – just look at your dividend graph now, and I can see it now at the end of this year with new heights hit almost every month, pushing up the net worth! Good to see the MB is still ticking over – it may not be much but its still ££ in the bank, and tax free, so can’t grumble at that! Good luck on the job hunting, and be thankful you werent living month to month or you would have had to take the first job that came along even if you hated the look of it! The MB is just about ticking over, not a great start to Feb but we’ll see if I can still make something positive by the end of the month! Agree, I am very thankful that I’m in a position of ‘luxury’ to not have to jump at the first job opportunity. Not seen anything remotely close to something I want yet but it’s early days! Enjoy your blog and the comments you leave on various other FI blogs. Good luck with the job hunt. Cannot recommend a book called “Where’s My Oasis” by Rohan Manahan highly enough for job seekers – you should be able to get it from the library. I often say to people that if you are looking for a job and haven’t read this book you aren’t serious. I am sure you are serious but consider giving it a read! All the very best and keep on posting! I checked out ‘Where’s My Oasis’ but as it was printed in 2004, it’s no longer available in my library. I’ve got some ‘tools’ to hand so to speak, the main one being LinkedIn and the back-to-work website provided by work’s out placement support. Thanks for reading and for the kind wishes. Fantastic start to the year Weenie. Have you considered shifting from Premium Bonds given the new rate? I’m thinking of moving to peer to peer lending but I’ve been ‘thinking’ about it for the best part of two years. Yes, I saw in the news that the NS&I are dropping their rates again but to be honest, I still think it’s the best place to leave my cash. At the moment, actual cash (including my premium bonds) only accounts for 5% of my entire portfolio. I have a bit invested in P2P – interest isn’t bad but as part of a simplification exercise, I may start shifting funds out, into other investments. I have almost 12% ROI on P2P. It is hard for me to find a similar profitable investment anywhere else. Especially considering the relative short loan periods, the fast access to the funds etc. I have now invested a large part of my reserves, still waiting for those excellent opportunities for cheap dividend stocks. Since I started investing in P2P over 2 years ago, my ROI has been around 14%. However most of my loans are long term, ie 3-5 years so for me, it’s not so easy to access the funds, not that I want to but it just means that I’m pretty much stuck with them should things change in a negative way. Also, I want to try to have more of my investments sheltered from tax and none of my existing P2P accounts provide tax relief. It’s true that a couple of them are now able to provide ISAs but I’m not looking to invest new capital and existing capital/loans can’t be converted into ISAs.